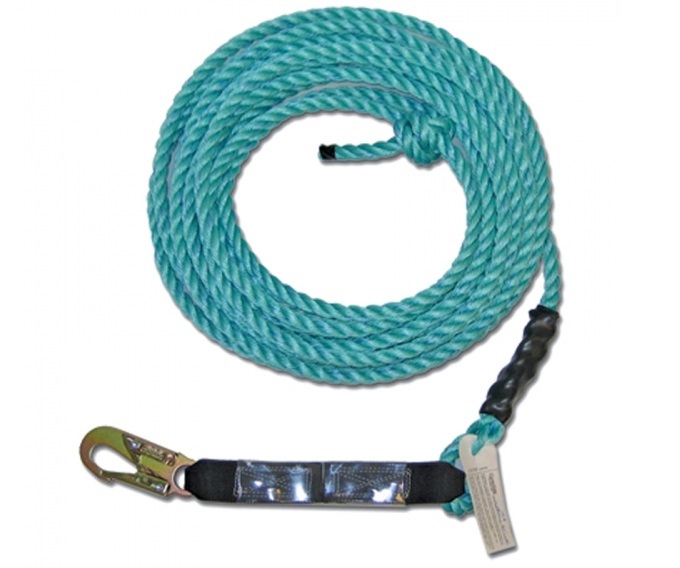 The Poly Steel Rope is ideal for high-moisture environments. Nylon rope, when wet, will typically reduce in strength by between 10% to 15%, but unlike Nylon, Poly Steel Rope does not absorb water, so will not diminish in strength in wet conditions. This rope is also particularly strong when it comes to resisting damage from ultraviolet light, and its synthetic composition makes it especially resistant to cuts and abrasion, thereby increasing equipment lifetime. Poly Steel is ten times stronger than Polypropylene, and while it may become fibrous, this is just a result of normal wear, and does not indicate it needs to be replaced. It is 5/8 inches thick, and is available with a variety of component configurations, including a shock absorber, positioning device, 18 inch extension lanyard, and 2 double-locking snaphooks.